My list of Top Ten Things To Do in Kenya continues..
6) Game Drive- That’s where we saw the Wilderbeest crossing the river and also the many lions. One of the most stunning sights we saw was a leopard on a branch of a tea almost 50 feet above the ground with the carcass of a fully grown Wilderbeest. The guide pointed out to us that he had probably taken it up on a tree to keep it safe from lions and hyenas. Not just that, he told us the leopard is a much more intelligent and dangerous hunter than even the lions and asked us to imagine the strength and power involved if he could drag a Wilderbeest weighing approx 200-250 kg up a tree purely by the strength of his jaws. Pretty sobering thought, isint it? 🙂 That was the Number 3 of the Big Five that we saw. For the cheese lovers I would also suggest visiting the Browns Cheese Factory. Also a must experience is the fine dining experience at the Ali Barbour’s Cave Restaurant in Diani. It’s an open air coral restaurant in a cave where one dines 10 metres below the ground and under the stars. 9) Nairobi Safari Walk- The Nairobi Safari is driving distance from Nairobi. While it may seem a bit off to visit a zoo while one can see wildlife in the open, I would recommend it as a chance to see the animals up close. At the Nairobi Safari Walk-we got to see the animals that we had not managed to see in the wild. Most memorable among these-was seeing the hyenas and the leopard. Anyone who has underestimated the lowly hyenas-will definitely change their mind on seeing them up close. The hyenas looked more deadly than any other animal we had seen- barring the leopards. The hyenas have a few inches of difference in height between their hind legs and their front legs and that’s what gives them their weird loping walk. The hyenas we saw had their cage diagonally opp the antelope cage. The keeper told us that even though they are well fed-they continuously pace up and down and are completely restless as long as they can see the antelopes-so much so that at night their cage has to be covered with a cloth because as long as the antelopes are in front of them they won’t sleep at night. That and the information that the hyenas jaws are strong enough to break any bone in the body was enough to get us moving speedily away from the cafe. 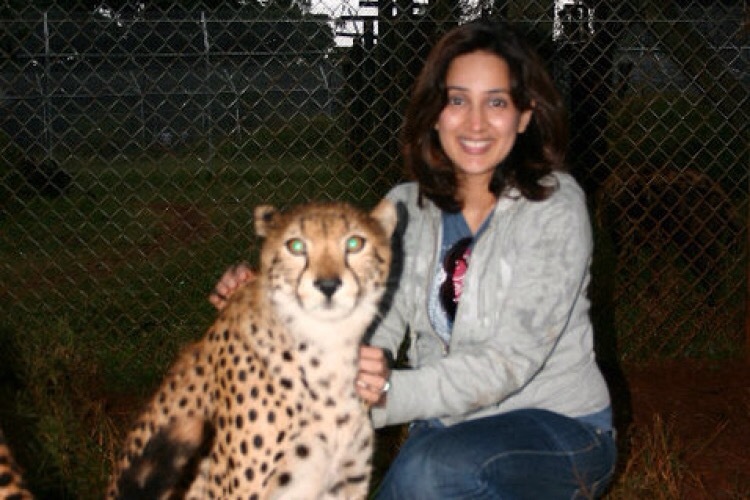 And yes here’s the Pièce de résistance of my trip-me inside the cage with three cheetahs. Let me just say-I wasn’t on any substance and neither were the cheetahs, if you see them up close the iris of their eyes appears yellow, yes-it was a scary experience but I was not scared, I doubt it’s legal and no I have no regrets…. :-) am definitely going to be telling my grandchildren this story! The leopard cage was the only one with a wire wall around it almost 150 feet high and that was because the leopard was smart enough to use a tree in the centre of his cage to leverage himself onto the top of the wire wall and had managed to get himself out of his cage-that too twice! Wow!